Natanz is a town in Isfahan Province, that lies on the slopes of Markazi mountain range, whose highest peak is known as Karkas. Natanz is located at a distance of 326 km south of Tehran and 74 km southwest of Kashan. Its people are sympathetic and have a sweet accent which is 3500 years old. The Sassanid kings changed Natanz into a park and residence for governors of the region. In the distant past Natanz had different names at different periods such as Natan, Nimsour, Natin and Natouz. It has always been a center of farming and hard work, with artists and carpet weavers and pottery makers who have left many artistic works behinds. Natanz has a four-season climate and because it lies between the desert and the slopes of Karkas mountains it produces many different fruits and vegetables of highest quality: apples, pomegranates, apricots, almonds and walnuts as well as many vegetables. Natanz is best known for its pears, with Taameh village being the center of its pear gardens. Today, because many farmers are migrating to the cities and their children do not care for farming and looking after gardens, these fruit gardens and farms are falling into decline. Natanz also produces medicinal herbs which are cultivated and harvested in different seasons and sold to various parts of Iran. Koushk Fire temple, made of stone and mortar dating back to the Sassanid Era. The tomb of Sheikh Abdolsamad in the Jame Mosque, built in 1308 AD. The monument of Baz dome on the top of the mountain close to the main gateway to Natanz, built during the reign of Shah Abbas. Such famous men as Sheikh Abdolsamad Natanzi, Alameh Majelsi, Adib Natanzi, Seyed Vaghef and poets like Zeynolabedin Ansari and Mirza Bagher Hossein Barzi, poet of Safavid era, have risen from this land. 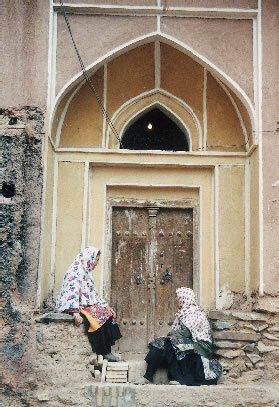 The presence of Zoroastrians has resulted in the penetration of certain Zoroastrian terms into the local dialect, and therefore it is partly known as a Pahlavi- Zoroastrian dialect. Carpet weaving and farming are the main professions in which women and men of this region are engaged side by side, though carpet weaving is usually performed by women and girls. The carpets are sold in markets of different cities especially Kashan and Isfahan. The patterns of these carpets are greatly under the infl uence of Kashan designs. Animal husbandry is another profession performed as small-scale cattle raising in local family farms, and work on large cattle farms belonging to land-lords. Most families keep several sheep or goats for dairy products. Traditional cooking, using copper and stone pots, is prevalent among the local people. In the past there used to be a bakery furnace in each district of Natanz where women would get together once a week and bake traditional bread. The traditional clothes of the people of Natanz consist of loose black trousers, black vests and white shirts which hang over the trousers, felt hats, giveh (cotton shoes) for men, and fi gured kerchiefs, long and short pleated skirts, colored vests and fi ne givehs for women. Natanz had 72 villages at one time, some of which still survive and have made some progress in economy and agriculture, and some others are now empty of inhabitants due to migrations to the cities. 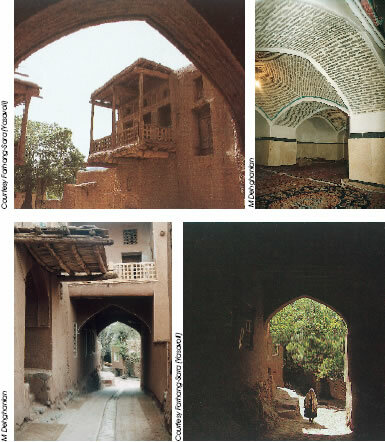 Abyaneh is the largest existing village close to and considered to be a part of Natanz City. It is a little village whose inhabitants have persistently preserved their traditional way of life, architecture and clothings. UNESCO has selected Abyaneh as one of the 100 historic "towns" of the world.